rosoft.Crm.Setup.Server.PublishDefaultDataAction failed —>System.MissingMethodException: Method not found: ‘Void Microsoft.Crm.CrmCache`1.RemoveEntry(System.String)’. 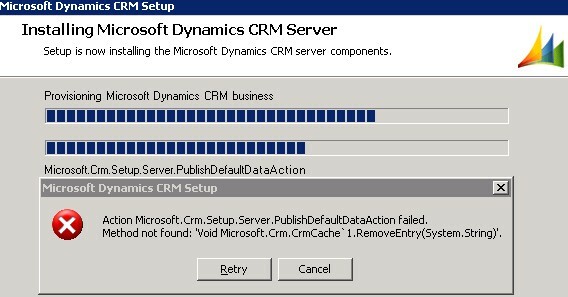 Solution: Already Installed CRM-EMail router and srs connector are deleted and re-installed. Evrythng worked fine. Web Server Supports Weak SSL Encryption Certificates ? Note: The issue with this is, if the website also needs to respond to http ( not https), then we have to create a second ip address ( I have used internal IP) and second virtual website. This also prevents older 64 bit browsers from accessing the server. – How to find whether the machine is 32/64 bit on Vista / windows 2003 server? Ans:- 1) Click Start, Click run , Type sysdm.cpl and then enter. 2) Click General Tab, Where you can see the 32 -nit or 64-bit OS information. 200 – This is general response code when a requested page is loaded properly. 301 – When a page has moved permanently. This happens usually by implementing a 301 redirect. 302 – When a pages has moved temporarily. 400- Bad Request & this is caused because the request could not be understood by the server due to incorrect syntax. 401- Unauthorized user , When ever a page requires authentication and is failed causes this. 403- Forbidden Error- is caused when the request is OKAY from server side, but the server is refusing to fulfill it. 404- Page Not Found – Is caused when the server has not found anything matching the requested URL. 500- Server Error – Internal Web server Error. 501- No Server – Is caused when the function not implemented in web server software. 502- Server Over Load – Could be the bad gateway & a server being used by this Web server has sent an invalid response could be the causes for this. 503- Service Unavailable – It causes due to the temporary overload or due to maintenance. 504- Gateway Timeout – A server being used by this server has not responded in time. Sol: – Changed the database to Single User Mode using below method and this helped to restore it . Note: Stopped Async Service which didn’t helped . Even tried by stopping IIS which is helpless. Sol: In Restore window-> Options tab, check ” over existing database”, now try to restore. It worked for me.